Another spectacular day through Salt Creek. The hiking was super easy- completely flat and mostly all on trail (no more creek splashing) which allowed me to focus on everything around. The varied landscapes offered so much diversity of life and scenery. The trail constantly was switching between forest and brush land between green meadows and swampy reed fields. And the birds continued to be everywhere! 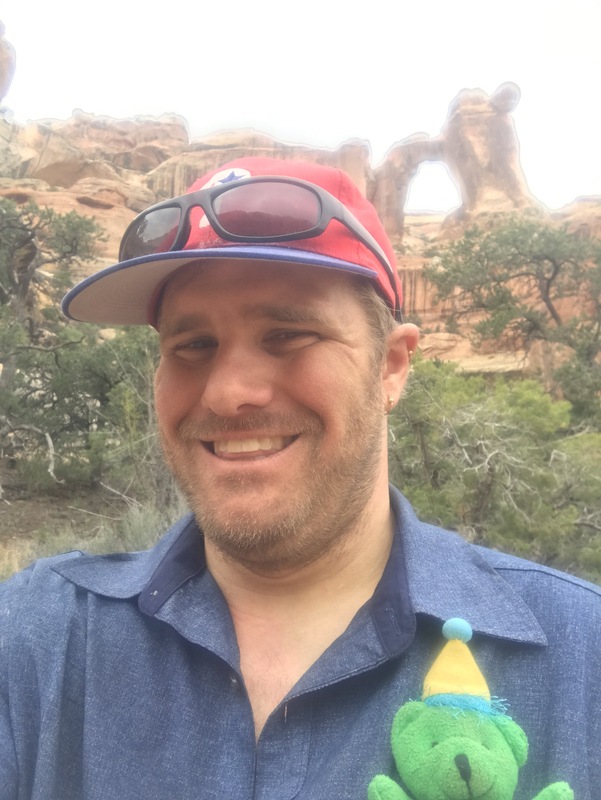 After 3 miles I got to a trail junction, dropped my pack and took the easy 3.2 mile roundtrip side trail to Angel Arch, one of the biggest in the park. It was a fantastic spot. I took some photos and headed back to the main trail- picked up my pack at the junction and headed on my way. About 10 minutes later I patted my chest pocket and had a sudden horrifying sinking realization. Lydia Geopet was not with me. 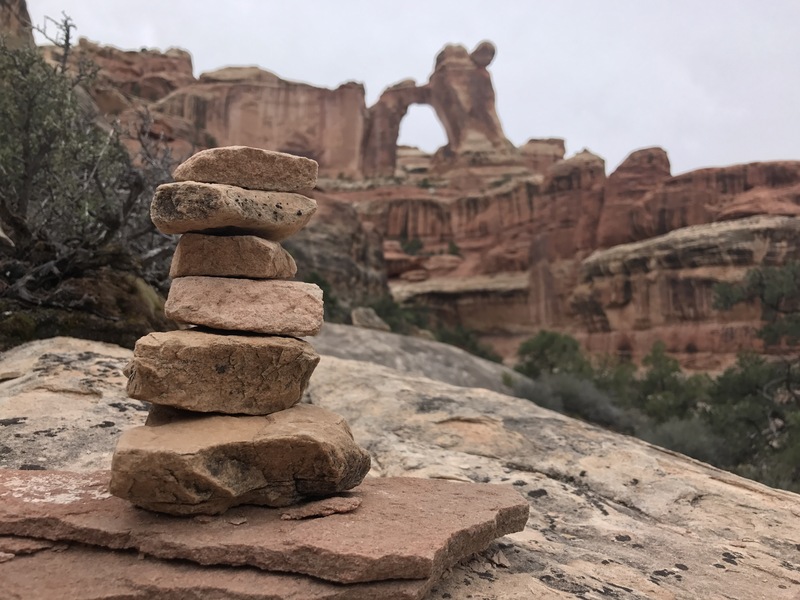 I took a picture of her at Angel Arch, and then left her sitting on the rock! I felt like Tom Hanks watching Wilson float away…but the ocean….er…trail wasn’t going to win this time! 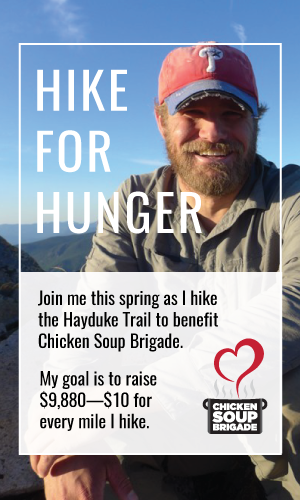 I immediately dropped my pack, grabbed a water bottle and began sprint walking back. 4 extra miles and an hour and a half of walking time later we were safely reunited and on our way again. Phew. Not long after the reunion I ran into my first group of people of the day- really my first folks on trail all trip, not counting the Devils Garden tourists. It was nice to actually speak- using my voice has been rare. In quick succession I ran into an older couple out for the week heading through, a father and son from Portland out for a day hike from their campsite and a solo hiker heading up this section. 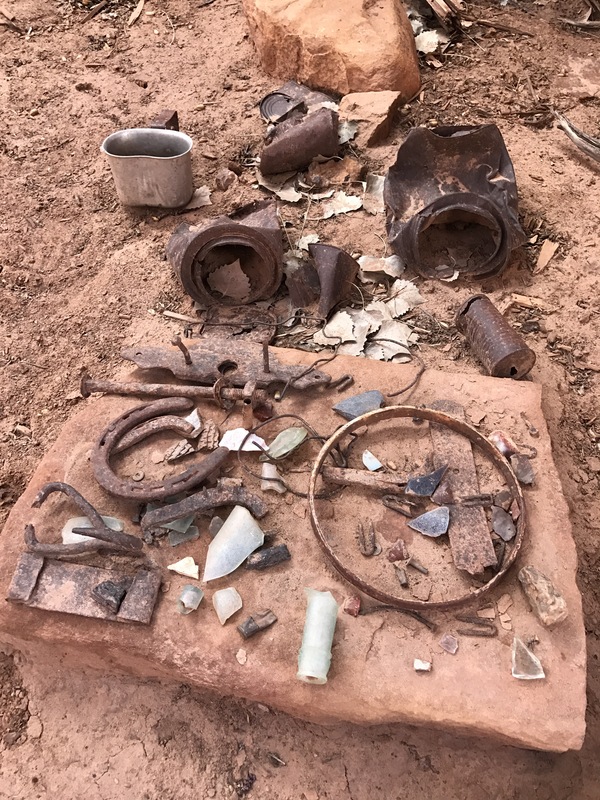 After the creeks Upper Jump, the narrow winding canyon opened up and the creek began running through beautiful open green meadows which allowed easy visibility to all the archeological sites along the walls. 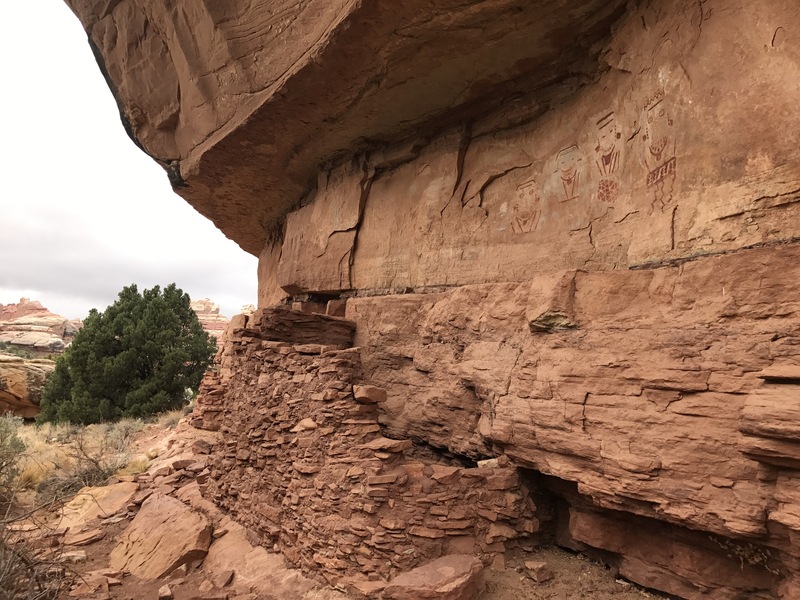 All over the Upper Salt Creek Valley are remnants of the Ancestral Puebloan peoples (they’re also known as the Anasazi, but that’s a name taken from the Navajo meaning “Ancient Enemies” which isn’t well reflective of the people). The Ancestral Pueblo culture developed over time in the Four Corners area with its peak from about 700-1300 AD. During that time they built massive cities like Mesa Verde and many other elaborate dwellings and structures. 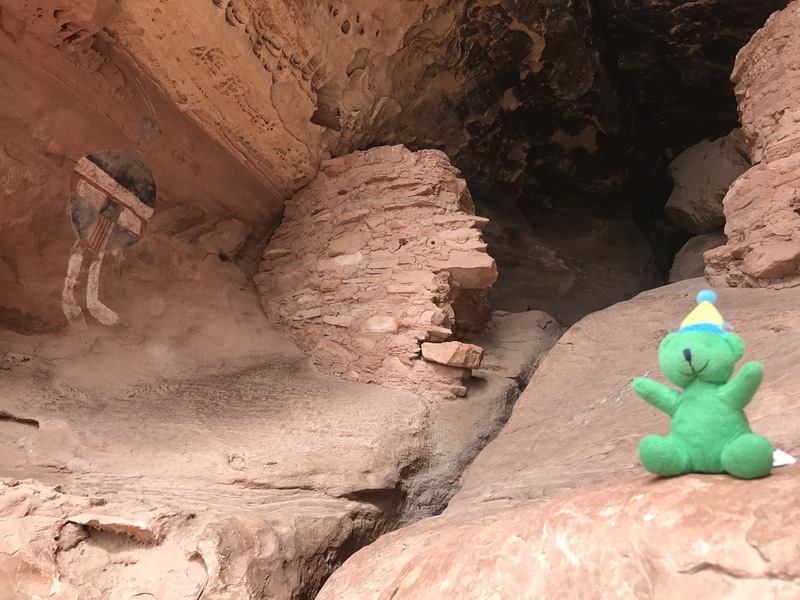 The two main things I saw in this area were granaries, where they stored their food, and rock art- sometimes both in the same place! The granaries were nestled into the cliff walls. I stopped by 3 that I saw just off trail, one had some very cool art above it and the other still has squash growing in it from the original seeds!! Notice the human figure pictographs on the wall above the granary! Perennial squash from the Ancestral seeds. I counted at least 7 new shoots. The most incredible thing though was the All American Man, a pictograph painted high in an alcove of a man holding a red white and blue striped shield. It’s one of the most famous ones in the area. There’s been debate about if it’s authentically Native, or an elaborate 19th century cowboy prank, but the general scholarly consensus is the color pigments and style too closely match other verified Ancestral art in the area for it to be a fake. The All American Man. Lydia Geopet made a new friend! I love learning about the history of an area- I feel like you can much more deeply appreciate it as you walk through if you know a bit more about what to look for. 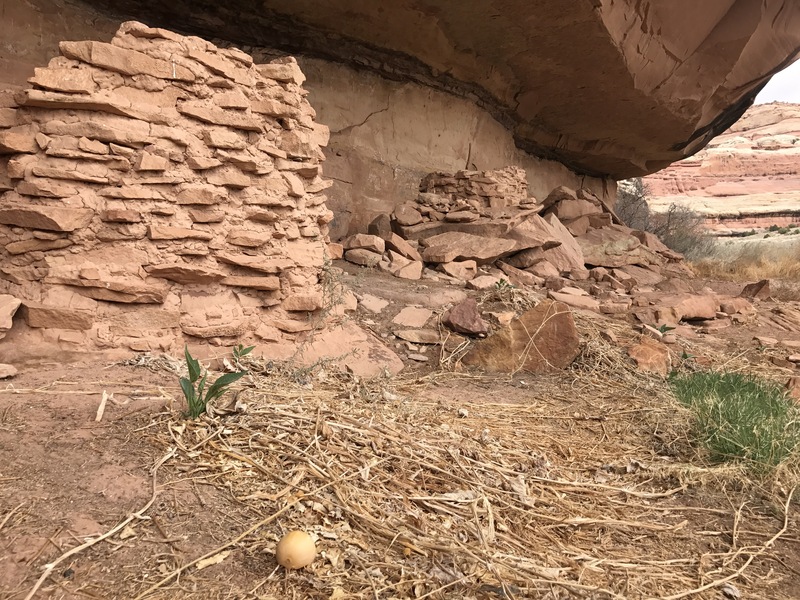 The area isn’t just rich in Ancestral Puebloan history though! I was shocked at one point towards late afternoon to round a bend and find a perfectly built log cabin! Fireplace in the side, broken down wagon and corral outback. Lots of artifacts inside. I found out from a passing hiker a few minutes later that the cabin was built in the 1890s by a rancher named Kirk and the road I’ve been following is the road he built to access his homestead. 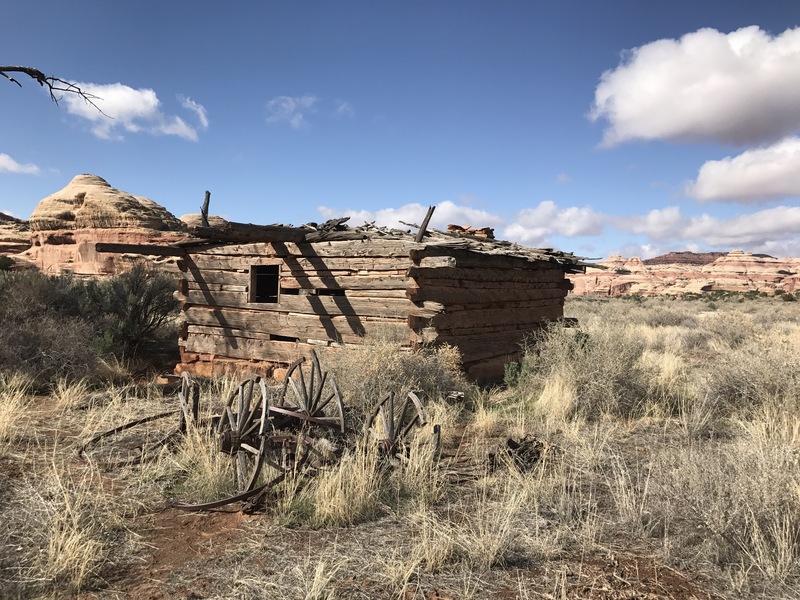 He only stick around about 10-15 years, but his cabin and corrals continued to be used up until the 50s by passing cowboys with their herds. Apparently the road wasn’t even officially decommissioned until the late 1990s (which caused a lot of controversy- the county actually suing the Park Service to try to keep it open) It’s so fascinating! The surrounding rocks and cliffs were also changing too. Gone were the red and yellow and grey cliffs I’d been among for this first week and in its place was a band of pinks and whites like a layered strawberry cake. Changing rock colors. Pinks and whites! Another awesome day. 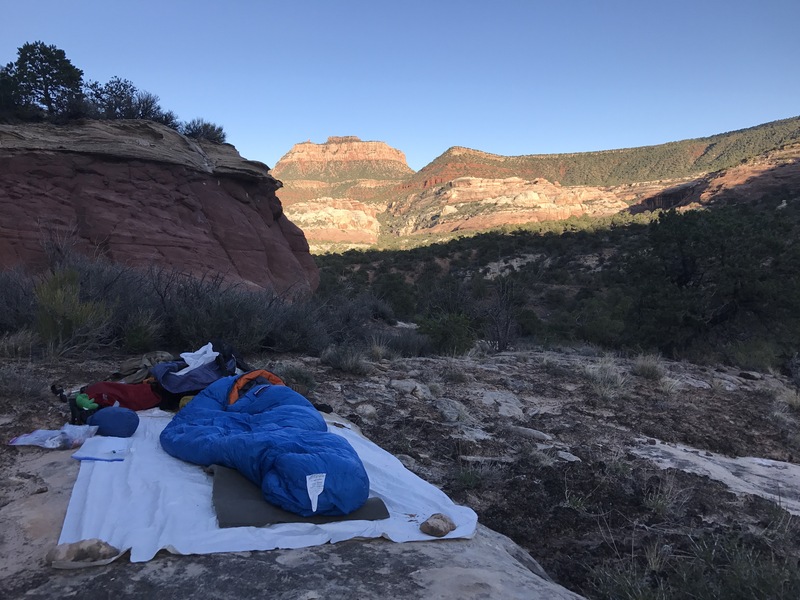 I hiked out of the park and set up camp about a half mile later on a slopey rock so I could get out of the sand for the night. 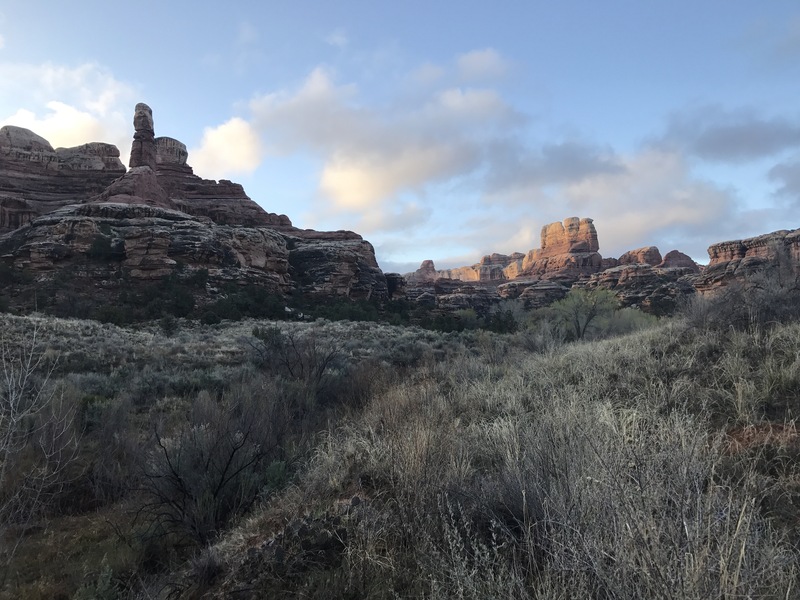 I’m definitely going to need to come back to Canyonlands. 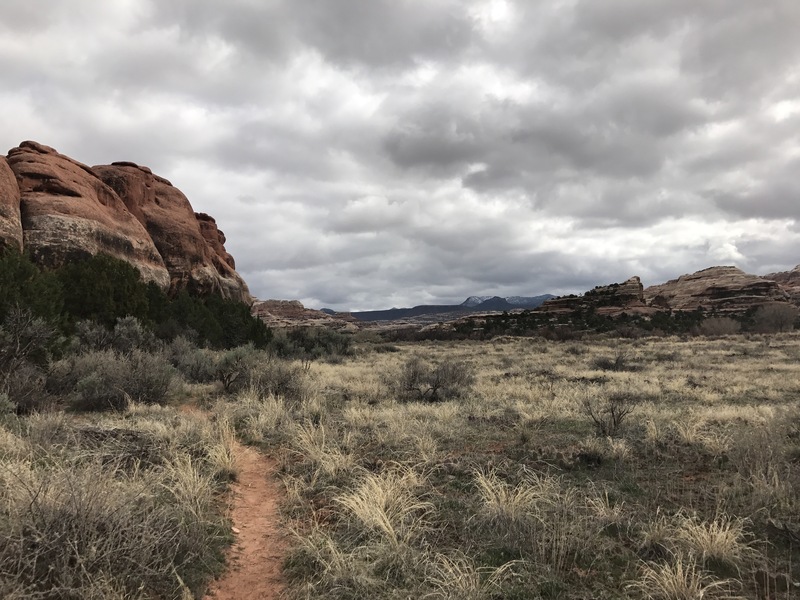 It’d be great to see Salt Creek when it’s in full greenery and also to see the rest of the classic places in the park: The Needles…The Maze…the list could just go on and on and on.